Zeee RC LiPo batteries are light weight and provide high energy storage to weight ratios, are capable of safe fast discharges, have quick recharge times,and no "memory-effect"
- Zeee 2s 5200mah Lipo Batteryspecial designed for professional 1/10 scale and 1/8 scale RC car hobby models such as: Traxxas Slash, Emaxx, Bandit, Rustler version, Losi, Team Associated , etc. - It also cuould be used for RC airplane, RC helicopter, RC boat, drone, FPV, only if the voltage, weight, dimension and plug match. 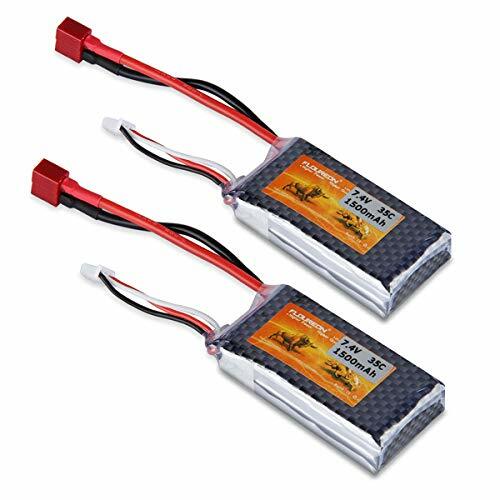 - Zeee 7.4v lipo battery 5200mah with 50C discharge rate hardcase offers you very high power and very long run time for your RC cars. - The hardcase of Zeee 7.4V 2s lipo battery 5200mah provides your batteries very solid protection, it comes with an equipped Deans plug. They are your ideal chooses for the RC car hobby. -For the RC battery, only if the voltage and the plug match, then it will fit. -Please stop charging immediately when the cell voltage been charged to 4.2v (Normal cell voltage is between 3.7v~4.2v). -To double make sure safety, please have a check first whether the battery surface is alright when you get it and whether the voltage is normal before using. - If the new battery won't hold a full charge or loss the charge very quickly in short time, please use Balance Charger to charge and recycle several times first. Application - Zeee 2s 5200mah Lipo battery specially designed for 1/8 and 1/10 rc car, Losi, Traxxas Slash, HPI Strada XB 1/10 RTR Electric Buggy, Team Associated, Axial, Tamiya, Duratrax, Jammin, Redcat Racing, Exceed RC, ElectrixRC, Emaxx, Bandit, Rustler version (Only if the voltage, dimension and the plug match, then it will fit). High Performance - Zeee 2s lipo battery with 50C discharge rate hardcase offers you very high power and very long run time for your RC cars. They are widely fit the 1/8 and 1/10 RC car model. 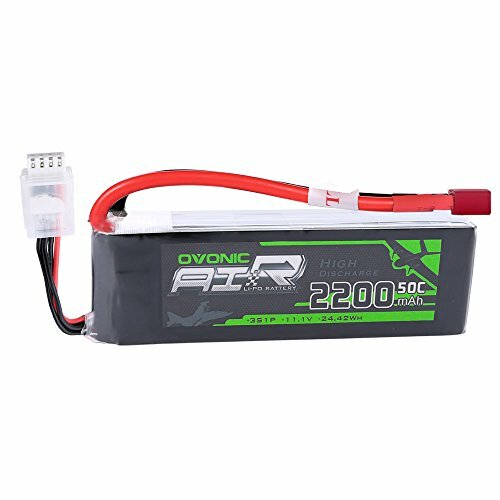 When you want a powerful battery pack that you can depend on even when you push it to its limits, this Ovonic 50C 3S 2200mAh 11.1V LiPo Battery with Deans Plug is for you. RC Airplane, RC Helicopter, RC Car, RC Truck, RC Boat, Remote Control, Drone, FPV, Skylark m4-fpv250, Mini Shredder 200, Indy250 plus mojo 280, Qav250, Vortex and Emax nighthawk 250 and other RC DIY Parts. Charger to charge and recycle several times first. Virtually all 1/10 scale vehicles as Traxxas Slash, Slash 4 4, Bandit, Rustler, Stampede, Stampede 4 4, E-Maxx, E-Revo, Monster Jam Replicas, etc. Lipo batteries are potentially hazardous.Improper usage can cause fire or explosion. Just using a Lipo compatible balance charger Only! Never charge above 4.2V per cell and discharge below 3.2 Per cell. Stop use of the battery if it expands or the temperature reaches above 70 Celsius / 160 Fahrenheit. Do not short the battery's positive and negative terminals. 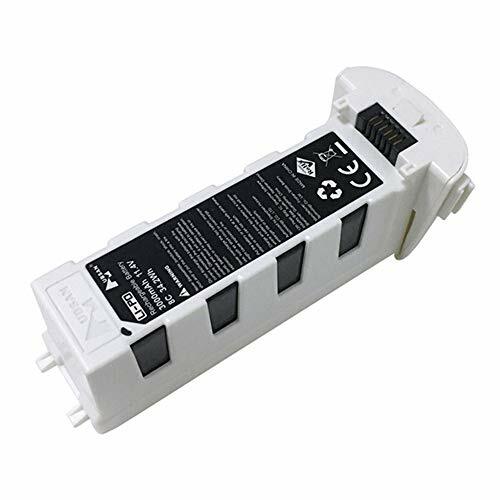 Zeee Power is a professional factory which focus on research,development,production and sales of Li-Polymer,LiFePO4 rechargeable batteries, Jump Starter and accessories. 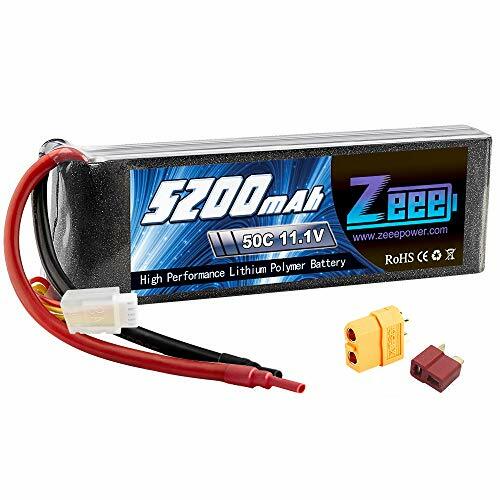 Application - Zeee battery lipo 2s 7.4v 5200mAh specially designed for 1/8 and 1/10 rc car, Losi, Traxxas Slash, HPI Strada XB 1/10 RTR Electric Buggy, Team Associated, Axial, Tamiya, Duratrax, Jammin, Redcat Racing, Exceed RC, ElectrixRC, Emaxx, Bandit, Rustler version (Only if the voltage, dimension and the plug match, then it will fit). Note: This pack is for RC Airplane receivers only. 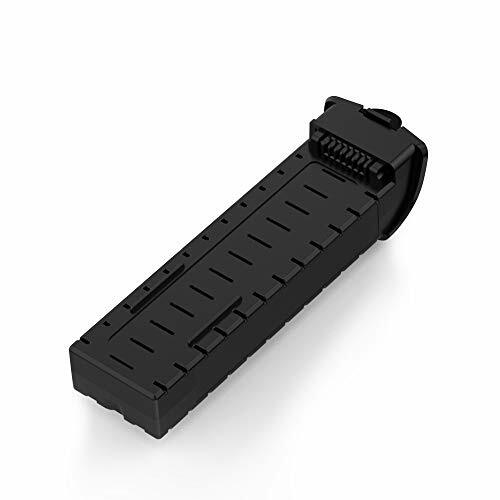 INCREDIBLE PERFORMANCE - High capacity of 2000mAh RC receiver battery pack with Hitec connector delivers 6V of power, can be rapidly charged so that you spend more time with your hobbies. The long runtime makes this an ideal hobby battery pack for better longevity. 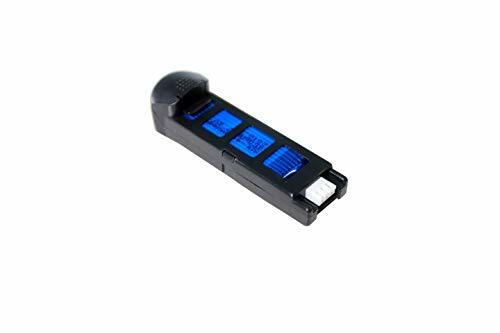 POPULAR BRAND COMPATIBILITY - The Tenergy rechargeable NiMH battery pack with Hitec connector works with most popular model RC airplanes and RC helicopters receivers. It can be used with popular brands such as Hitec, Futaba, JR, and many more. LIGHT WEIGHT BUT POWERFUL - Our NiMH flat battery pack is ideal for radio receiver planes with a Hitec connector. It manages to pack a powerful punch while weighing in at only 0.31 lb/5 oz and measuring 2.83x 1.97x 0.59. QUALITY CONSTRUCTION - Made with 5 x AA high quality cells, Tenergy NiMH rechargeable battery is weld constructed to prevent heat damage to the cell with a 22 AWG silicone flexible wire. TENERGY WARRANTY - Shop with confidence knowing that your RC replacement battery pack is protected with Tenergy's guarantee; which includes 30 days money back and a great customer support team that will help resolve issues. All batteries available Ready-to-Run, Please select the right connector according to your original battery. At the same times, please kindly compare the dimension with your original battery. If you have any other special demand or problem, please feel free to contact us. Please remember: We are floureon! Ready to go and enjoy it ! 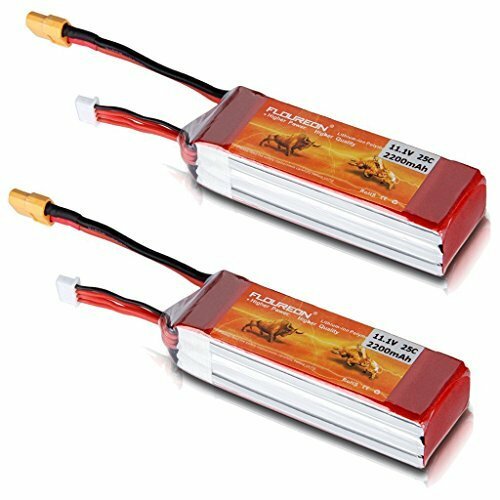 BEST RC BATTERY AVAILABLE - Our FLOUREON RC batteries are routinely voted by broad hobby fans, please do remember that our focus on quality is 2nd to none. BROAD COMPATIBLE Fits for RC Cars, Truck, Truggy, Traxxas, Helicopter, Drone, Associated, Axial, Racing, Exceed RC, Emaxx, Bandit, Rustler version, etc, any remote devices required 7.4 voltage with T plug. CONVENIENT & SAFE Our high technology enables quick & constant charging at anytime, and no cell memory effect so that you do not need to full discharge before recharging. All of our RC batteries are available use at anytime. WARRANTY - 60 DAYS MONRY BACK & 18 MONTHS EXCHAGE - We guarantee you'll love our FLOUREON RC battery and if you aren't absolutely satisfied, returned it within 60 days for a full refund, no questions asked. The battery fit Hubsan H501S H501A H501C drone ,please don't use it mixed with other drones. Keep battery temperature lower then 45 C when charging or it may result in damage to the battery. Have any problem please contact with Mifly Drone staff first , thanks . Compatible with drone H501S H501SS H501A H501C. Hubsan Lipo 7.4V rechargeable battery 2700MAh . Charge time :about 150 mintues . RC airplane, helicopter, car, truck, boat, drone, FPV, etc. (Only if the voltage, dimension and the plug match, then it will fit). - Lipo batteries are potentially hazardous.Improper usage can cause fire or explosion. 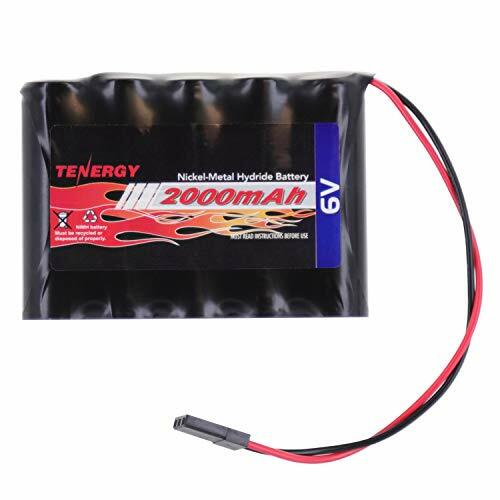 High Quality Material : 1600mAh rechargeable battery for Hosim 9125 RC Car. Safety Guaranteed : Built in over charging, over discharging, over temperature protection. Ensure safe charging and using. Strong Powerful :Uniquely designed & manufactured for high RC Racing performance. Peak Performance Pack : The Tenergy 7.4V Rechargeable Battery Pack features a high capacity rating of 1600mAh. 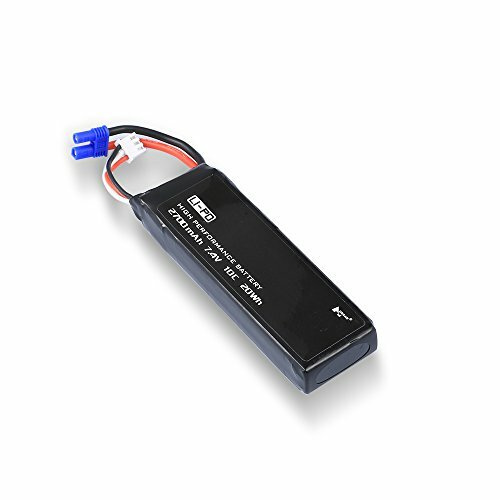 Increase the runtime of your RC unit with a battery that will go the distance! Original Accessories : Lightweight, durable, practical and convenient to use. Kindly reminder that please check your rc car's plug before purchase. Experience all the performance that's been engineered into your Traxxas models! Our new iD-Equipped Power Cell batteries deliver unmatched speed, acceleration and power in all Traxxas cars, trucks, and boats. Power Cell batteries are available in standard, 6-cell ""flat"" configuration as well as 7-cell flat and ""hump""-style packs. The 7-cell pack offers 15% more voltage to give your model maximum acceleration and speed depending on your model, top speed can increase by as much as 10mph simply by installing a 7-cell pack, no other modifications required! The 7-cell hump pack fits in all Traxxas models except E-Maxx, Summit and E-Revo, which require a flat pack configuration. 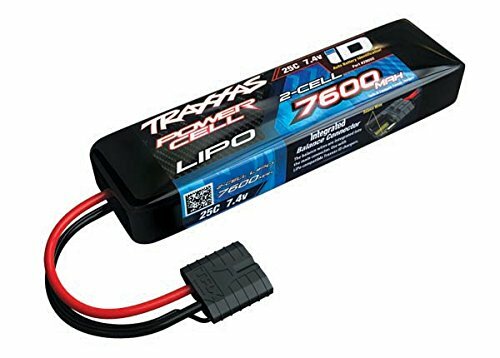 Traxxas Certified iD-Equipped LiPo batteries provide the punch and power to reach maximum speed. They come in a full range of capacities and configurations. Traxxas iD-Equipped LiPo batteries are engineered to fit Traxxas models perfectly and maximize their potential. Only Traxxas gives you more of what you want: simple installation, a great price, and the most speed and run time available. The patented Traxxas High-Current connector is the standard for efficiency, ease of use, and high-current handling. The balance leads are integrated into the connector eliminating separate balance wires and connectors as well as external balance boards. 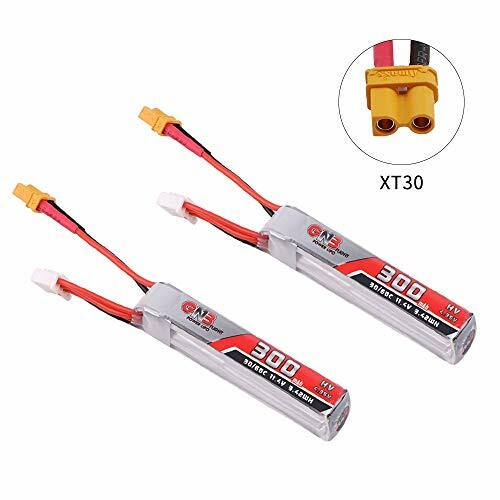 The Traxxas High-Current Connector allows current to flow freely with virtually zero voltage loss due to resistance. Large, textured surfaces provide good grip and the reverse-polarity protection makes them virtually impossible to plug in backwards. Shrouded wire connections eliminate the need for heat shrink tubing. Beefy, gold-plated copper terminals with large, spring-loaded contact areas ensure a perfect connection every time. 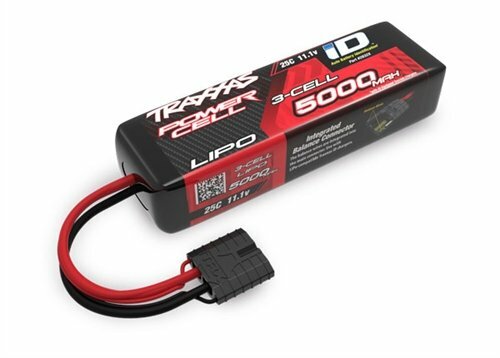 Traxxas iD-Equipped Power Cell LiPo packs use a unique construction that results in a firm, rugged, and compact pack that does not require a hard case. This gives them greater capacity and allows the user to monitor the condition of the battery. Unlike a hard-cased pack, if a Power Cell LiPo "puffs" or softens due to damage or abuse, the user can easily see and feel the change in the pack. Power Cell LiPos are constructed of premium cells with extra-wide discharge tabs to maximize their performance. Power Cell LiPo packs feature low resistance 12-gauge Maxx Cable wire, soldered directly to the LiPo cells to minimize resistance. 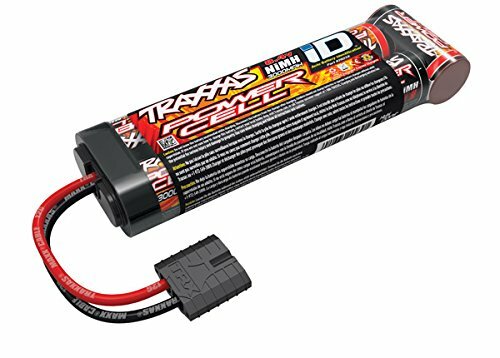 Traxxas offers the best battery warranty and exchange program available. For the first year, Traxxas will replace any battery found to be defective at no cost. After one year, any Power Cell LiPo battery can be exchanged for a new equivalent for just 50% of the pack's retail price. Check carefully the battery condition about the battery surface and battery voltage before using or charging. Use professional lipo battery charger ONLY. Any issues about the battery, please enter to YOUR ORDER to contact our customer service for help. Warranty: Manufacturer warranty for 90 days from date of purchase.For USA customers,you are able to approaching to our USA child company for after-sale service. Floureon company was formed in 2005. Through organic growth the company has expanded its Market presence and capabilities as represented in its four locations across North America. Floureon Stands: More professional, Higher quality and Better service. Looking forward to your support and your positive affirmation. All of Floureon batteries comply with RoHS and CE quality testing standards. Kindly Note: All batteries available Ready-to-fly, Please select the right connector according to your original battery. At the same times, please kindly compare the dimension with your original battery. If you have any other special demand or problem, please feel free to contact us. High Capacity, More Powerful - High capacity up to 200Wh/Kg energy density, Long cycle life (150 times minimum); Superior Japan Lithium Polymer raw materials; Advanced battery technology, doubles your devices performance time. Professional and Reliable - specially designed & manufactured for your high-quality RC devices. Floureon always be strict of product quality, all of the battery comply with RoHS and CE quality testing standards, worry-free of safty. One-year Battery Warranty - We guarantee you'll love the FLOUREON RC battery and if you aren't absolutely satisfied, returned it within 30 days for a full refund. 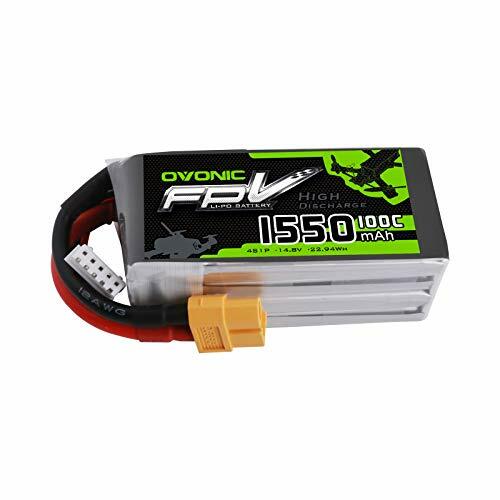 When you want a powerful battery pack that you can depend on even when you push it to its limits, this Ovonic 100C 4S 1550mAh 14.8V LiPo Battery with XT60 Plug is for you. Specially designed for Nemesis 240 Mini, Tweaker 180 Micro Quad, LRC Freestyle V1(270-296), MXP180 FPV Quadcopter, Danaus, Vortex, FLIP FPV 250S MINI,FLIP FPV 260H MINI), RC Airplane, RC Helicopter, RC Car, RC Truck, RC Boat, Remote Control, Drone, FPV. 2. When charging the batteries, please put them in an open space and keep away from any inflammable goods such as Carpets, sofa, bed and etc. 3. Please don't use high current USB adapter charger that higher than 2A to charge the battery. 4. When changing the battery, don't pull hard when the battery is stuck, otherwise you may destroy the wire of battery and its inner structure, which will cause battery fire when charging! 5. If the battery swells, please discard it and don't use again! 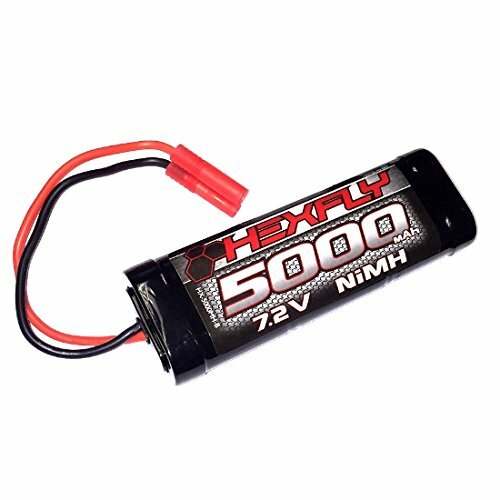 Redcat Racing Part # HX-5000MH-B version 4.0 5000 Ni-MH battery 7.2V with banana connector. This part is compatible with Redcat Racing Blackout SC, Blackout XBE, Blackout XTE, EVEREST-10, fossa SC10, ground POUNDER, lightning EP drift, lightning STK, lightning STR, SANDSTORM, Thunder EPX drift, Tornado EPX/EPX pro, and volcano EPX/EPX pro models. Redcat Racing is located in the United States and has a full staff of support personnel to help you with your Redcat Racing product. Consult your vehicle manual for correct fitment and assembly. Since 2005 Redcat has been your source for fast - affordable - fun! Use only genuine Redcat Racing Replacement parts to achieve the best performance with your Redcat Racing vehicles. Please consult your user's manual to ensure this is the correct part for your model of vehicle. Compatible with the following Redcat Racing models: Blackout SC, Blackout xbe, Blackout XTE, everest-10, fossa SC10, ground Pounder, Lightning ep drift, Lightning stk, Lightning str, Sandstorm, Thunder EPX drift, tornado EPX/EPX Pro, and volcano EPX/EPX Pro. Charging Status: At the beginning, the green light will flash slowly and the red light will be on. When the battery is fully charged, both red and green lights will be on. Status of Charging:Green indicator light keep flashing slowly when the battery is under charging.When the battery is fully charged, both red and green lights will be on. 1.Charge Protection: Overcharge Protection of Lithium-ion. 2.Low Voltage Protection: Receiver stop working when batteries voltage is lower than 6.5V. 4.Receiver will protect drive and control circuitry and work again after cooling down to the pre-set temperature. It is work for Hosim 9125 rc cars. Fast Charging : With this Hosim smart balance charger, the battery can be charged for 2-3 hours and more efficiency than the normal one. 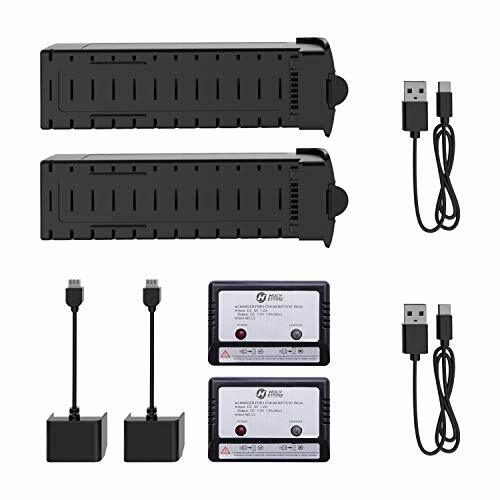 Charging Protection Performance :Overcharge Protection of Lithium-ion, low voltage protection and high-temperature Protection are covered in this Balance charger. Zeee is a professional brand specializing in the research, development, production and sales of Li-polymer rechargeable batteries. - - Light weight, long cycle life, no "memory-effect". 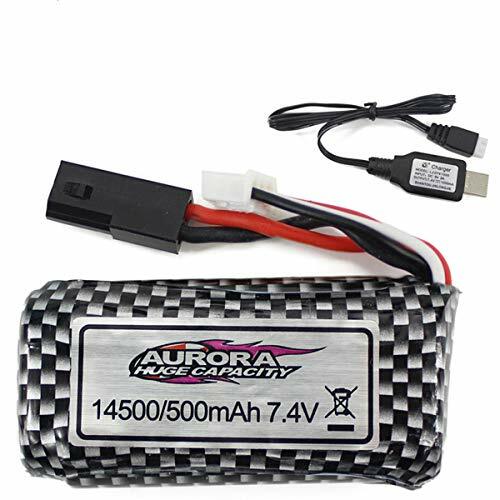 - High power battery, high capacity provide your rc model more energy, more enjoyment. - High Discharge rate, make your rc vehicle work powerfully. 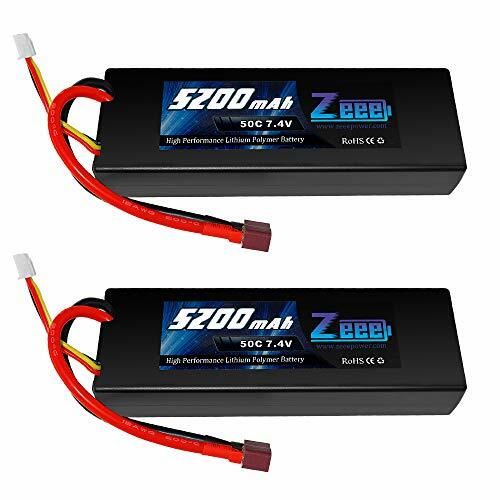 - Zeee 2s 6000mah Lipo Battery special designed for professional 1/10 scale and 1/8 scale RC car hobby models such as: Traxxas Slash, Emaxx, Bandit, Rustler version, Losi, Team Associated , etc. 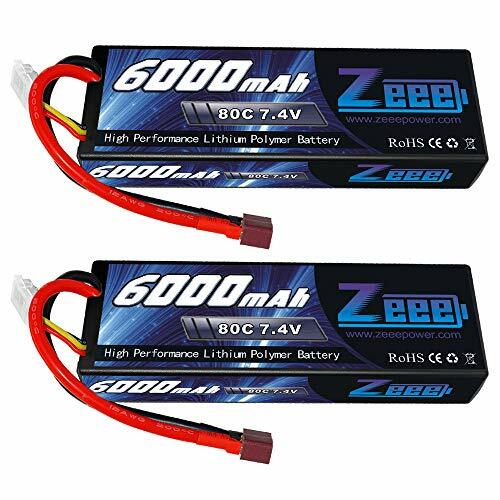 - Zeee 7.4v lipo battery 6000mah with 80C discharge rate hardcase offers you very high power and very long run time for your RC cars. - The hardcase of Zeee 7.4V 2s lipo battery 6000mah provides your batteries very solid protection, it comes with an equipped Deans plug. They are your ideal chooses for the RC car hobby. -NEVER Over-charge or Dis-overcharge lipo battery. - Please use Professional lipo battery charger. Check each cell voltage is normal before charging or using. 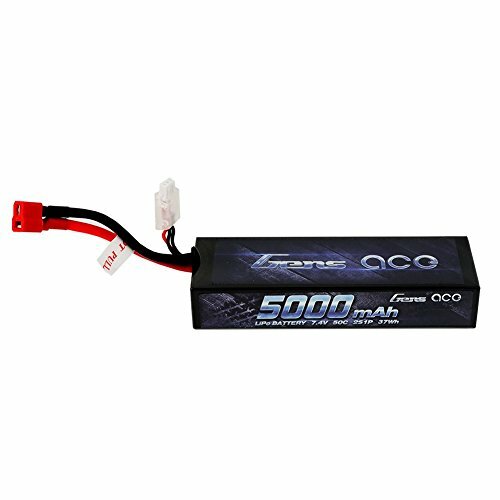 Application - Zeee 2s 6000mah Lipo battery specially designed for 1/8 and 1/10 rc car, Losi, Traxxas Slash, HPI Strada XB 1/10 RTR Electric Buggy, Team Associated, Axial, Tamiya, Duratrax, Jammin, Redcat Racing, Exceed RC, ElectrixRC, Emaxx, Bandit, Rustler version(Only if the voltage, dimension and the plug match, then it will fit). 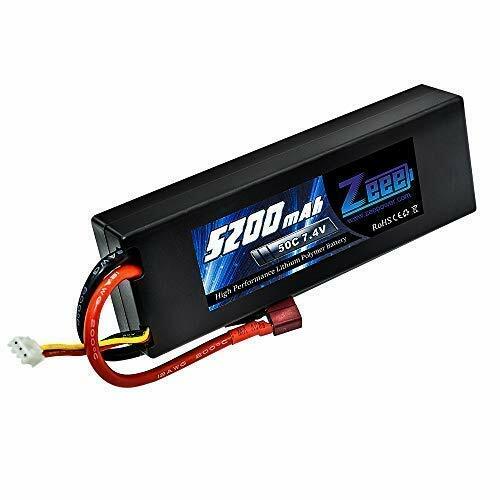 High Performance - Zeee 6000mAh 2s lipo battery with 60C discharge rate hardcase offers you very high power and very long run time for your RC cars. They are widely fit the 1/8 and 1/10 RC car model. Warranty: Don't over-charge, or over-discharge batteries and prohibit throwing battery into fire and water. 1.The rechargeable 7.4V 500mAh lithium battery is suit for the rc cars : B07MPZ3PY1. 2.Put the battery or pack at a safe place where infants or kids can not reach. Do not leave battery unattended while charging. 3.If the lithium batteries was detected corrosion, heat generation or other abnormalities, stop using them immediately. 4.Never disassemble, puncture, shock or crash the lithium battery. Put the battery away from water and fire. 5.Never use or charge the battery when any abnormal condition occurred like ballooned or swelled, leaks, overheat. [ Rechargeable 7.4V 500mAh Lithium Battery ] -- It is used for RC car high speed racing vehicle RTR monster remote controller truck. ASIN: B07MPZ3PY1. [ USB Charging Cable ] -- The USB cable could work with any household adapter with USB port, like mobile phone charger, power bank, Laptops & PCs etc. [ Spare Battery for Replacement ] -- Every 3-4 hours charging supports 15-20 minutes playing time. Spare Battery and Charging Cable for replacement. [ Reduce Battery Cost ] -- Recharging battery highly reduced the battery cost, economically and environmentally-friendly. [ Get Extra Playing Time ] -- By obtaining spare batteries, it will give you more playing time. 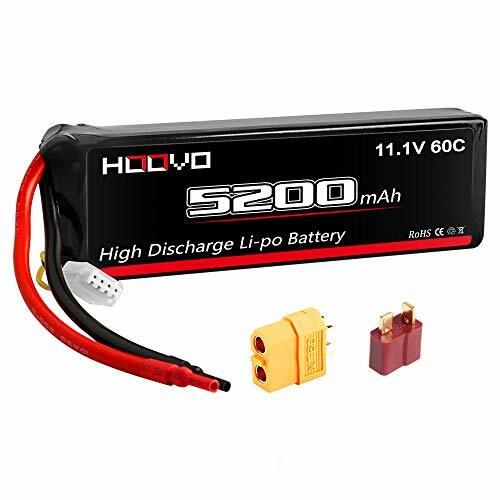 HOOVO is a professional brand specializing in the research, development, production and sales of Li-polymer rechargeable batteries. Strict matching progress, excellent consistency. Choosing us is to choose good quality. - Light weight, long cycle life, no "memory-effect". - For the RC battery, only if the voltage and the plug match, then it will fit. - Don't over charge exceed 4.2V and don't over discharge below 3.7V. - Check the battery condition carefully before using or charging. - For any questions, pls feel free to contact us through "Your Orders" tab of your Amazon account, we will respond within 24 hours. Professional and Reliable - Specially designed & manufactured for your high-quality RC devices. Hoovo always be strict of product quality, all of the battery comply with RoHS and CE quality testing standards, worry-free of safty. Specification - Cells Number: 3; Voltage: 11.1V; Capacity: 5200mAh; Discharge: 60C; Discharge plug: XT60 T Plug. Dimension - Battery Dimensions: 155*48*24mm / 6.1*1.89*0.94inch (L*W*H); Approx Weight: 13.64oz / 386.6g (including wire, plug & case). High Performance - High power battery, High capacity, Long cycle life (150 times minimum), More powerful, More funny. 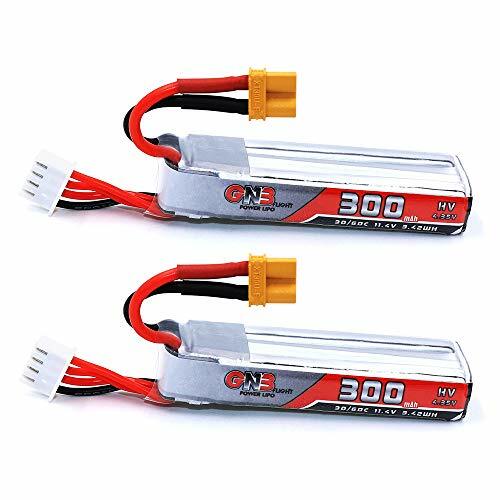 These lipo battery do not require special handling on drone . 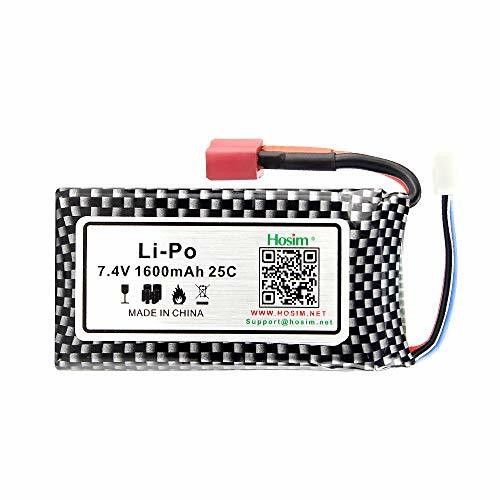 Hubsan 11.4V 3100mAh rechargeable Li-Po battery for 4k drone zino . 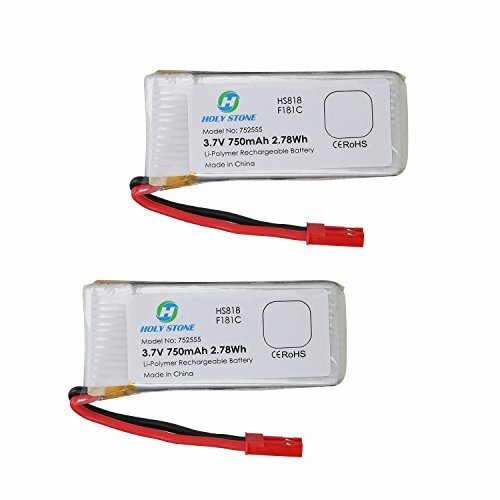 Hubsan original and brand new drone battery work for zino( H117S). 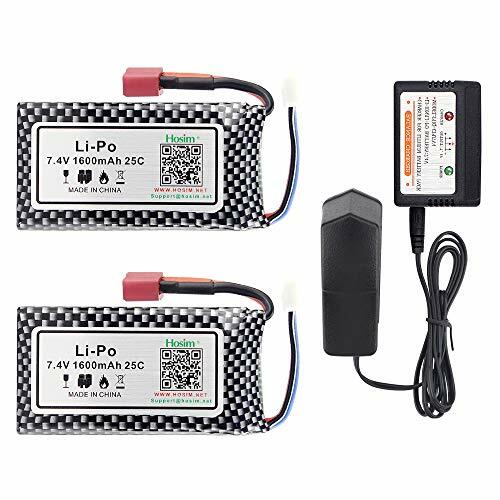 Battery voltage:11.4V 3100mAh rechargeable Li-Po battery . Charging time: 180mins , flight time: about 23 mins . OEM battery weight about 200g. Package included :1* 11.4V 3100mAh lithium battery . 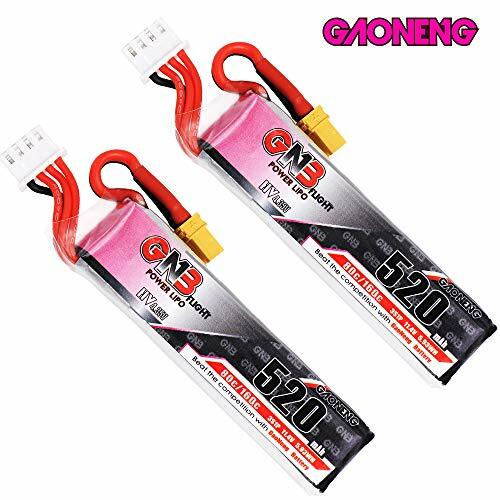 - Zeee 4s 6500mah Lipo Battery special designed for professional 1/10 scale and 1/8 scale RC car hobby models such as: Traxxas Slash, Emaxx, Bandit, Rustler version, Losi, Team Associated , etc. - Zeee 14.8v 6500mah lipo battery with 80C discharge rate hardcase offers you very high power and very long run time for your RC cars. - The hardcase of Zeee 14.8v 4s lipo battery 6500mahprovides your batteries very solid protection, it comes with an equipped Deans plug. They are your ideal chooses for the RC car hobby. Compatible With - Zeee 6500mAh battery pack will supply you with a HUGE amount of run time. This is virtually all 1/8 Scale Vehicles such as 1/8 Buggies, Truggies, Monster Trucks that require a 4S LiPo battery pack. (Only if the voltage, dimension and the plug match, then it will fit). 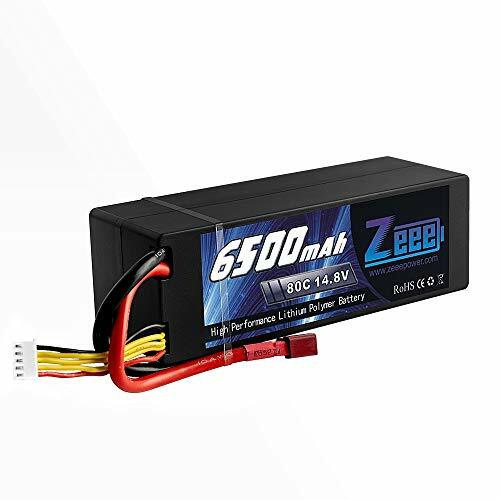 High Performance Zeee 4s 6500mAh lipo battery with 80c discharge rate hardcase offers you very high power and very long run time for your RC cars. They are widely fit the 1/8 and 1/10 RC car model.